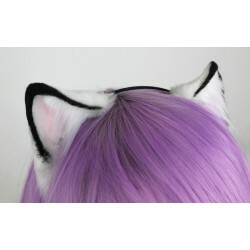 These are made with the realistic kitten ear pattern. Black tips and pink inside coloring were hand painted/dyed. By buying this product you can collect up to 2 loyalty points. Your cart will total 2 points that can be converted into a voucher of $0.60. I was really taken away of the quality of these ears! They are amazing and beautiful! The paint job is really neat and clean! It’s super soft and it’s even better than the photos! Please select your reason for contacting us! Please log in so we can get your order numbers! By sending this message, I am confirming that I have read the FAQ prior to submitting this form. I also understand that if my question can be answered by reading the FAQ, my email may or may not be answered by Customer Service or IT Support.